Not your typical peanut butter cookies. There fudge filled cookies are soft and chewy with satisfying peanut butter taste to fix your cravings. Being a food blogger I’m always tempted to try out new combos, new recipes or follow the food trends (more or less). Sometimes I forget the classic recipes. Those that have been passed from generations to generations. They are still among our favorites for a reason. 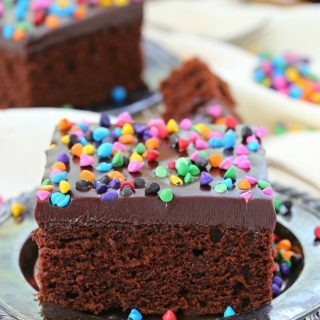 They remind as of childhood, family times and even if you’re like me, born outside US, you’re more likely to start enjoying these classic desserts because everyone loves them. You’ll find them at church gatherings, potlucks, parties, you name it. One of the classic desserts are peanut butter cookies. 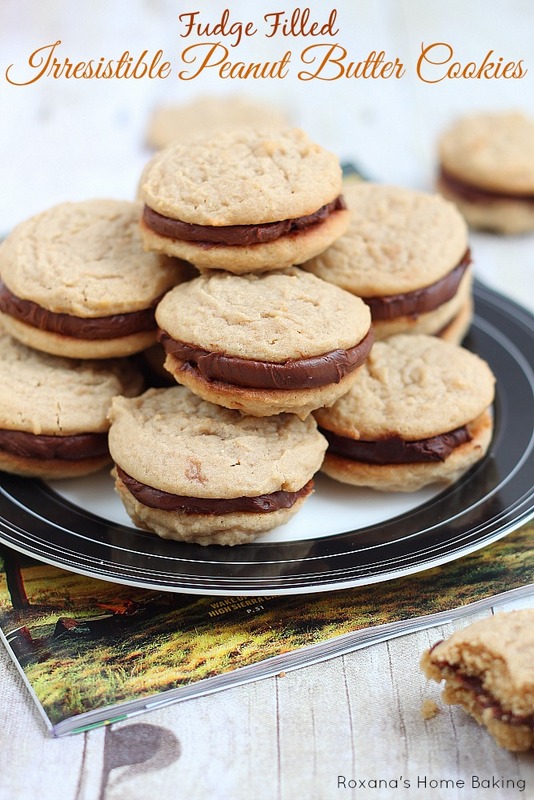 I’m pretty sure everyone has their favorite peanut butter cookies, just like another classic, chocolate chip cookie, but one bite of these fudge filled cookies and you’ll be hooked. 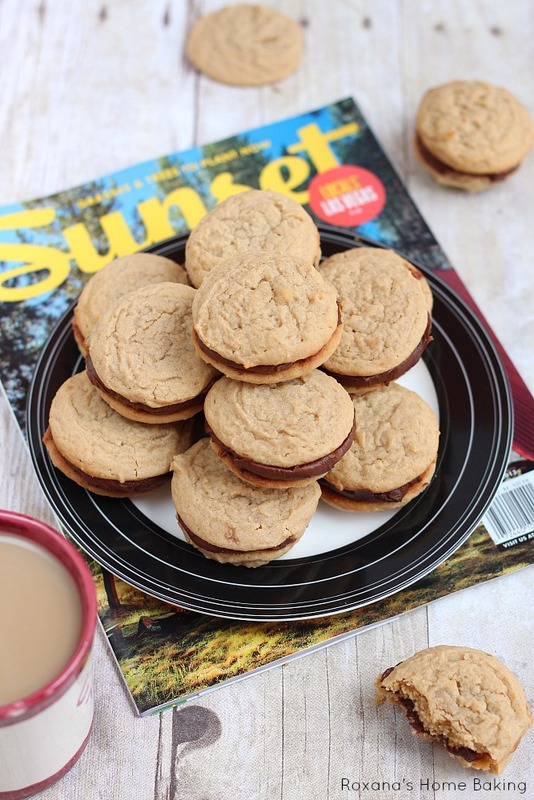 The recipe for these cookies comes from the November issue of the Sunset magazine, slightly adapted. Because I prefer to use butter versus shortening in my baking, I used only butter in these cookies. Although it’s true that using shortening will result in chewier cookies if you use only brown sugar will cut on the crispness the dairy butter gives to the cookie dough, adding moisture, thus making the cookie chewy. The molasses added to the brown sugar enhances the flavor of the peanuts making these cookies even more irresistible. Once the cookies are baked and chilled it’s time to sandwich them with the heavenly chocolate fudge. I swear I could have eaten it with the spoon but I had to control myself and continue with the photo shooting. Some days, it’s really hard to be me. Heat the oven to 375F. Line baking sheets with parchment paper. In a mixing bowl add peanut butter, butter, brown sugar, milk and vanilla. With the paddle attachment on, stir on low to medium speed until light and fluffy. Add eggs, one at a time and beat until blended. Add the flour, baking soda and salt, Stir on low speed until just incorporated. Using a medium size ice-cream scoop, drop cookie dough on the prepared sheets. Bake in preheated oven for just about 7 minutes or until the edges are beginning to brown. Cool for few minutes on the baking sheets before cooling completely on wire racks. 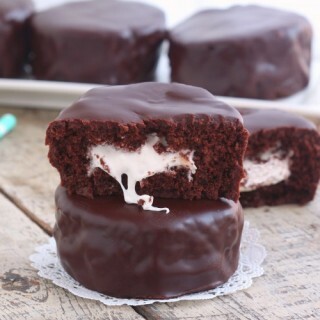 While the cookies are cooling, make the fudge filling. In a small sauce pan add the condensed milk and chocolate chips. Heat over low heat until the chocolate is melted and the mixture is smooth. Stir in the vanilla and let the fudge sit at room temperature for 15-20 minutes. With a spoon, spread some on half of the cookies on the flat side. Sandwich them with the remaining cookies. 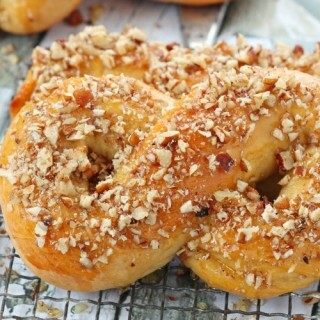 Love peanut butter cookies, but this filling sounds so delish! 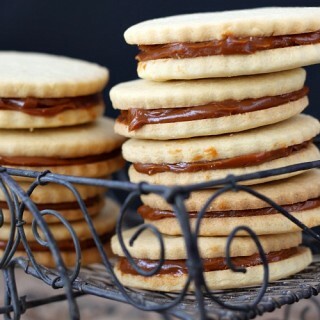 I love sandwich cookies, these look like such a treat! I can really appreciate the classics. I love new creations to but I don't any cookie will ever top a good old classic chocolate chip. Love the peanut butter and chocolate sandwich. Definitely a sweet treat I would enjoy. These cookies truly do look irresistable Roxana! Hi Pamela, The recipe yields 36 cookies, not sandwiches. If you sandwich them like I did, you'll have just 18. Oh, good to know. A must better number of cookies! They look like my dream cookie, peanut butter, chocolate! Oh wow! !